Available in Designer 1/2 oz. 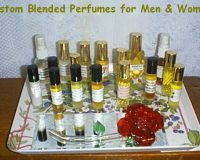 Roll-On Bottles are Essential Oils we have blended and can blend for you upon request. There are four groups of Scents: SPICY, CITRUS & FRUITY, EARTHY, and FLORAL. You can also just request single Essential Oil Roll-Ons like Lavender, Nag Champa, Patchouli, Mysore Sandalwood, Rose Damasacea, Jasmine, Neroli, Ylang Ylang, just to name a few. Just e-mail us with your desires at herbs@direcway.com or call our shop at 1-616-607-7058. Our Essential Oil Roll-Ons are blended with Jojoba Oil not alcohol they last all day until you wash them off. 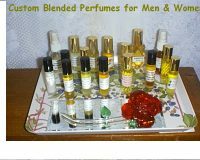 ESSENTIAL OILS YOU BLEND ROLL- ON PERFUME…1/2 OZ. LLIAC ROLL-ON PERFUME- 1/2 OZ. MYSORE SANDALWOOD ROLL-ON PERFUME- 1/2 OZ. WISTERIA ROLL-ON PERFUME 1/2 OZ.